We'd been at this for a year and half in LA, and while we had 40+ burgers left to try, we had already reviewed 100 in So Cal. We felt that it was time to publish a Top 10 List of our favorite burgers in LA. We judged the burgers on Beef, Seasoning, Sear, Preparation, Cheese, Bun, Meat to Bun Ratio, Fries/Sides, and Value. #10 JNJ Burger Shack JNJ Burger Shack served one of the best burgers that we have tried in Los Angeles. The value was remarkable, and the quality was strong. At JNJ Burger Shack, the care for the food really shines through. No shame on coming in 10th, JNJ Burger Shack--we will be coming back for more soon. #9 Smashburger OK, Smashburger was in Del Mar, but they are expanding, and it was a damn fine cheeseburger. Their goal is to be every town's favorite burger, and we like their chances. #8 Hinano This burger boasted an epic sear and tremendous seasoning. This was a delicious an honest cheeseburger. Update: 30MAY11 The quality fell off at Hinano. The prices went up, the beef was of lower quality, and the once great sear was no more. #7 Five Guy Burgers and Fries They were totally deserving of Zagat's Best Fast Food Burger for 2010 If you haven't tried one, do so. Do so soon. #6 The Six (How convenient--but only a happy coincidence) The Six made ground Chuck sing and dance. A funky, flavorful, and well-prepared cheeseburger was delivered by The Six. Here's where it got tricky...the next 5 burgers were all fantastic in their own rights...we heartily recommend that you try all of these beef and cheese masterpieces. #5 The Golden State Cafe Close to being a truly marvelous burger..prepared with care and skill but just short of the mark. #4 Bouchon A pricey but almost magnificent burger was enjoyed at Bouchon. The flavor was marvelous, but the lack of sear and the grind of the beef held this burger back from achieving complete excellence. #3 Go Burger Go Burger served up a darn good burger. We would have The Classic burger again, and we highly recommend it anyone that is in the neighborhood. We will be returning to try the Prime STEAKHOUSE Burger. Miru 8691 and the most recent review...This was about as good as Chuck could get--it was Kobe Chuck, after all. MIRU 8691 delivered a spot on interpretation of the cheeseburger with great precision and a little improvisation. Also, a damn good price for Kobe beef--the value really put this one over the top. 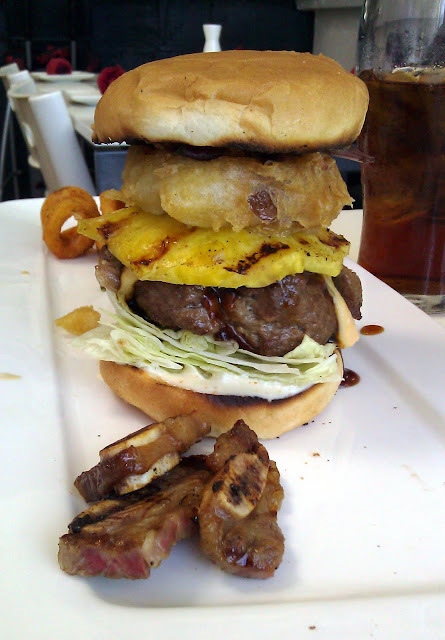 To replicate our burger experience, order the Kobe Burger Med-Rare with everything on the side (except the cheese). This cheeseburger was a subtle delight, and Chef Jung did something magical with the cheese. Wolfgang's Steakhouse This was one of the best cheeseburgers that we have tried in Los Angeles. The burger delivered powerful, honest flavors with precise attention to preparation. Keep in mind that we've also had off visits to Wolfgang's Steakhouse, so be sure to check that Chef Gonzales is in the kitchen. Ask the kitchen to cook your burger Med-Rare, and have them sear it on the hottest part of the grill to generate a crunchy sear. This cheeseburger was a tribute to steakhouse burgers and set the bar in that arena. #1 Umami Burger Yes, it's that good. The themes that ran through Umami Santa Monica were consistency, precision, and intensely satisfying flavors. They truly shamed almost every other burger that we have tried in Los Angeles by executing everything perfectly. This was an exemplary case of quality ingredients prepared with great care. If you have not tried Umami Burger, do it soon, because you NEED to try the best burger in Los Angeles / the Best Burger in America. NOTE: On 10MAY11 we resampled the burgers at MIRU8691, and we have concluded that the burgers at MIRU8691 have surpassed Umami Burger in terms of quality, preparation, and flavor. MIRU8691 is currently the #1 Burger in LA....Fat Bruce Lee thinks it's the the best in the US, and he is probably right. We have a HUGE backlog of burgers to work through, still. LA is a big place, and we are lucky that we a seemingly endless number of burger places to try. We probably missed your favorite, but we would be pleased to sample it and report back to you. You can reach us at TheBurgerBusters@gmail.com Or you can enter a comment below. The OG Burger at Miru's was truly a delight! The chili wasn't like any chili I've had before and the Kobe Beef was vastly flavorful. Yes, that chili was a thing of beauty! Always toast the buttered bun! Thick is good! Go Chicago! If you go thick...remember to put a thumb size indentation to the center of the burger.....so when it wants to plump up in the center it will return to a level burger for easier bun placement. Your reviews are marked by sober directness and clarity. You and this website are a true delight. However, this top ten list has shaken you out of form. There are some exaggerations, (either mental or hopefully merely verbal), that cause one to doubt your judgment. In other words, you seem a bit flighty. Lists should have finality if they're to have impact. This stunt of tacking on a new winner after-the-fact is embarrassing for all concerned. As a serious burger critic do you really want to use the cheap epithet “Photoshopped” to compare Umami unfavorably to other burgers? Do you know what “truly shamed” means? It means that almost every other burger COMPLETELY SUCKED. Secondly, you don’t use the didactic, hyper-judgmental “truly shamed” then modify it with “almost”. I’m not asking for complete consistency as a critic or writer. But just keep the flaky impulsivity down a bit. Points all well taken, Peter. The wheels came off of Umami Burger in terms of quality and consistency. Hinano changed all of the ingredients and are now coasting on their reputation. For the sake of clarity, I didn't use "photoshopped" as a pejorative. Photoshop makes things better but with a trace of artificiality. The near hyper-realism of the flavors at Umami Burger were good in a way that surpassed natural. That was noted but not unappreciated. 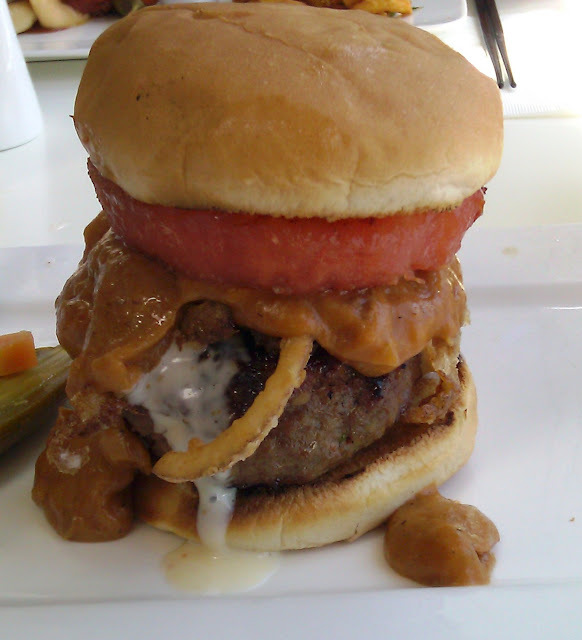 That point has since been rendered moot, though, and I miss Umami Burger when it was consistent...so it goes. I probably should have left that list alone, but have you tried the burger at MIRU 8691? Chef Jung tricks out his burgers with MSG just like Umami Burger, but Chef Jung does it with kelp broth. Cool. Burgers and burger reviewing are a nebulous affair to begin with, and often colored by the whims of fragile memory. I am heading to NYC tomorrow to do a handful of reviews. Any favorites in that city? Have a great trip. Growing up, dad used to take us to the U.S. Open Tennis Championships. Connors was great...the burgers so-so. Looking VERY forward to your NYC burger reviews. My list of prospects for the trip. I am scheduled to hit up Brindle Room, GoodBurger, Shake Shack, and Corner Bistro. I am shooting footage for a TV pilot at the end of the week, and they are part of the schedule. The list below is for new content. So many burgers and only one of me. I think I can fit in at least four of the new ones. My hotel has a good gym, so I will be working out hard in the mornings to burn through those things.